Ripple is targeting remittance companies. The scale of Ripple’s market share of the traditional remittance operators might actually be a majority. Most of the major names are either working directly with Ripple on implementing xRapid, or they are in the trial stage of technology adoption. The answer has multiple parts, but generally they can be distilled into a summary statement: because the competition won’t wait. 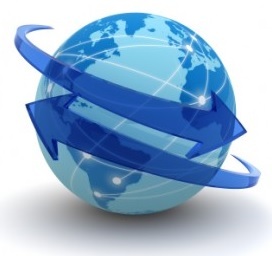 How Big is the Remittance Market? The size of the remittance market reflects its global scale and also the growing trend of labor internationalization. In other words, as more and more people are working overseas, more of them are sending money back home to family and friends. Why are Remittance Companies Interested in XRP? One of the biggest selling points for usage of XRP is its ability to dramatically lower the cost of cross-border transfers. XRP does this by replacing fiat currency as a bridge currency while transitioning value from one fiat currency to another. Large organizations like money transfer companies and banks can replace their costly Nostro account holdings with a software suite that dynamically sources liquidity via exchanges where foreign currency – and digital assets – are bought and sold. Based on this, we know that XRP has a powerful value proposition for reducing costs; but from what we’ve seen of banks’ inaction, why are the traditional remittance companies coming on board first? To understand the answer to this question, you have to back up and take a look at the entire remittance market, along with how the market share has evolved. While regulatory concerns may have caused a temporary delay of XRP adoption by banks, remittance companies are showing no hesitation to using XRP for cost-cutting. 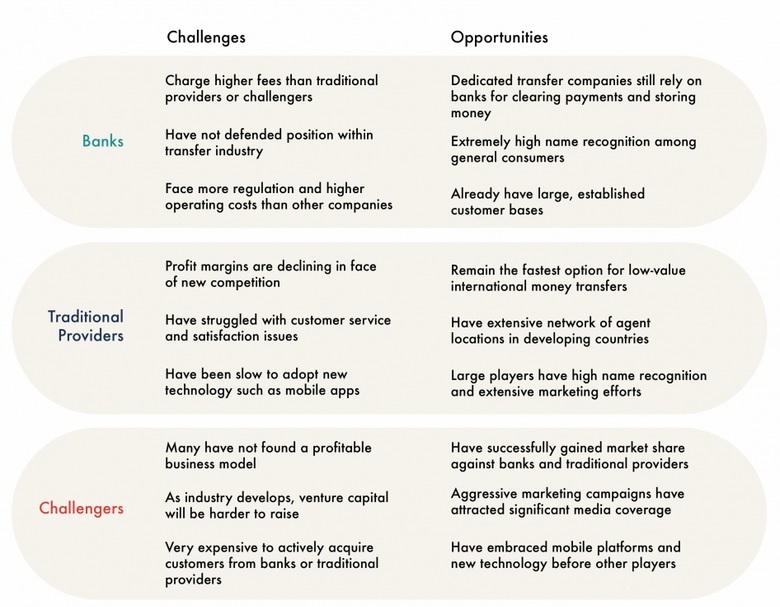 This is reflected on the pressure that they are feeling from what I labeled the “disruptors”, and what the online magazine "FXCompared" is calling “challengers.” The disruptors / challengers are utilizing new business models and technology to completely circumvent traditional payment channels. Let’s zero in on one; TransferWise. TransferWise doesn’t depend on traditional banking to move money, and so it completely leap-frogs the archaic SWIFT system and opts for an entirely new model: Transfer money across borders by not transferring money across borders. TransferWise is one of the disruptors that relies on a system that is, from my standpoint, a digital version of the Hawala system, where money actually never leaves the country, but credits are given to accounts in the foreign country to signify the transfer of value. It’s a unique approach that takes an existing business concept (crediting accounts in two separate countries without transferring money) and digitizes it, making it available to the masses. This enables TransferWise to offer low fees, but it is essentially going around the current system of cross-border value transfer by completely bypassing the correspondence banking system. It may seem like an uphill struggle to keep pace with the new disruptors – or “challengers” as some have labeled the new remittance start-ups. But it’s not impossible, and the traditional remittance operators have substantial advantages, including their existing network of operators, market reach, and name recognition and trust. This approach will enable the traditional money transmitter companies to compete on a cost basis, and innovate with new capabilities based on Ripple technology. Even at this early stage, we’re seeing new applications such as Santander’s P2P payment application.8 Yes, Santander is an example of a bank, but it demonstrates what’s possible for the remittance companies that are implementing Ripple technology; they can develop their own end-user applications to compete with the likes of Xoom, Alipay, and Venmo. How Many Remittance Companies Are Using Ripple? MoneyGram, Western Union, and the UAE Exchange are all confirmed Ripple customers. This comprises almost 100% of all the top traditional money transfer companies implementing Ripple technology – and that includes xRapid. This is a level of market adoption that other new startups can only dream about; in Ripple’s case, the technology and cost savings are so compelling that the move to leverage the software is a foregone conclusion for these traditional remittance processors. The answer to that is not crystal clear, although we know enough to draw the conclusion that it will have a positive effect on the price of XRP. What do we know about these companies’ plans to use xRapid? 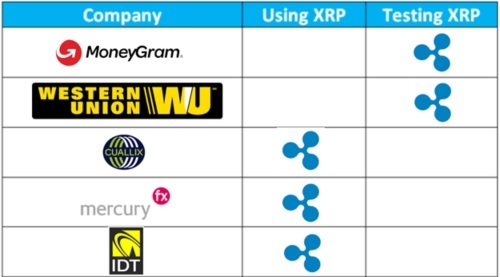 We know that both MoneyGram and Western Union are conducting trials of xRapid – the Ripple solution that utilizes XRP for settlement liquidity and for shifting value from one fiat currency to another.11 12 In addition to these two traditional remittance operators, innovators such as IDT, Mercury FX, and Cuallix may also give xRapid a try. Others such as UAE Exchange, Santander, and LianLian are confirmed to be RippleNet members utilizing a stack of Ripple technology such as those components underpinning xCurrent. Based on this understanding, to do a short-term analysis of expected utility-based demand from xRapid, we’d need to focus on the schedule of when the production implementation of xRapid will take place with these larger players such as MoneyGram & Western Union. However, it’s important to consider new entrants to the space, as these innovators may quickly gain market share based on lower costs and by focusing on specific niche corridors (e.g., Cuallix targeting US-Mexico remittance). Are There Any Remittance Companies Not Using Ripple Technology? Except for the rare exception like PayPal, most of the largest remittance companies are using Ripple technology in one form or another. This statement alone is awe-inspiring, but even more so is the fact that their competitors and allies alike are also using Ripple technology on the back-end. Whether it’s xCurrent or xRapid, the tools that Ripple provides to process and settle payments in real-time are already transforming worldwide commerce. The disruptor companies and new market entrants are also utilizing Ripple in most cases, although there is occasionally an outlier whose entire business approach is different (TransferWise, e.g.). However, this is the exception; even the small innovators are examining Ripple to leverage the near-zero cost of processing transactions. Of course, customers don’t have insight into the costs associated with these remittance companies; instead, they will be focused on the fact that their name-brand money transmitters can now settle a transaction in real-time instead of days or hours. One of the most common questions about XRP has to do with its core use cases – it’s use as a bridge asset to transfer value from one fiat currency to another. New XRP buyers sometimes ask why banks would use XRP. And for that question, the answer very straight-forward: XRP can save banks the most amount of money. For XRP investors, the prospect of increasing amounts of volume originating from businesses and organizations that have implemented xRapid is an exciting possibility. At some point in the current year, the demand from utility-based transactions will start to make itself known; but even more exciting than this eventuality for XRP investors is the groundwork that’s being laid for establishing real-world case studies for XRP’s cost savings. In some cases, banks have indicated that their concern over regulatory questions about using a digital asset was a sticking point. In other cases, it’s evident that banks may be opting to drag their feet and concede the remittance market to third parties. Whatever the reason, once Ripple can point to multiple examples of XRP’s cost savings, it will light the way for more conservative customers like banks – and perhaps central banks – to jump on board and activate xRapid for sourcing settlement liquidity. My prediction is this: When the smoke clears, the cost savings from using XRP as a bridge asset will be fully confirmed, and the upper cost savings estimate – 60% – will prove to be too conservative. My guess is that Ripple uses conservative numbers for this upper boundary, and that organizations will realize very quickly the advantages to using Ripple’s digital asset. As a result of this, we will see a scramble happen in the industry, and in banking. Even though many businesses presently make public statements about using blockchain technology in the hopes that Wall Street investors will reward their (public) support of this new technology, in some cases the industry has seen more lip service than real change. Blockchain technology is more subtle and difficult to properly fit into a technology stack; in some cases, digital assets have been created not to solve a problem, but instead to create a new value network. Not so with XRP; its use case is massive, and its performance capabilities as well as its scalability make it the perfect candidate to support global levels of transactions and business. For remittance companies, it’s obvious that there is a race in the market to be the first one to access Ripple’s promised cost savings. Who will be the first company to realize the massive cost savings? Will they immediately pass these savings along to the consumer in an attempt to increase their market share? Or will they simply become ever more profitable due to increased margins? Time will reveal all, of course; but in the meantime, I and my fellow XRP owners will continue to champion our favorite tried-by-fire digital asset.